Nearly a dozen years and over 14,000 pages of the Carteret County News-Times have been newly added to DigitalNC, courtesy of our partner, the Carteret County Public Libraries. While previously covering from May 1948 to March 1949, DigitalNC now covers from May 1948 to January 1960. Based out of Morehead City, this newspaper covers Carteret County and joins the Pine Knoll Shores, another newspaper that services Carteret County. The News-Times is a weekly and semi-weekly newspaper that offers mostly local headlines, although some are of national importance. Many are naturally about the North Carolina coast and maritime news, like the article to the right. 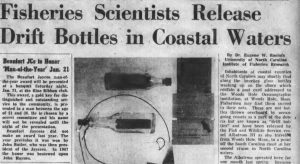 In early 1950, scientists at the Woods Hole Oceanographic Institution released glass bottles into the ocean off the coast, in order to test the ocean’s drift due to winds or currents. The bottles included notes that had a return address to the institute on them, and if the notes were returned, the sender received 50 cents back for their help. Having this massive increase in pages from the News-Times helps gain knowledge and increase representation of coastal North Carolina cities in our collection. To browse through other materials from the Carteret County Public Libraries, take a look at their partner page, or visit their website.